At first I thought it was his Rugged Green Shirt in different lighting – but it looked way too blue. I think Dean finds a shirt he likes and then buys it in every colour that the store has available. This shirt has visible seams and pleats in the front pockets. It’s a grey-blue. It also has a detailed extra thick shoulder seam. It first appears in Houses of the Holy (2x13). Dean wears it from his first appearance (enjoying the magic fingers) until after they find the body in the dead guy’s basement. 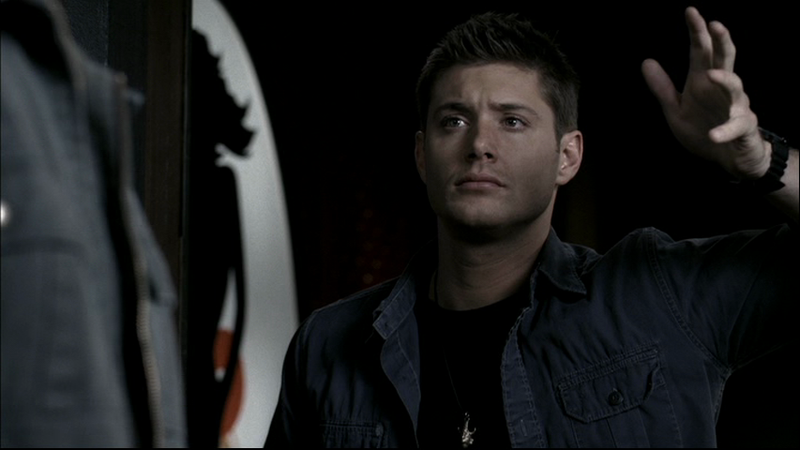 In Tall Tales (2x15), Dean wears it while he and Sam tell Bobby about what has been happening. In the flashbacks, you see him start to wear it from talking to the frat boy about his alien abduction onward. He changes before they go after the trickster though. 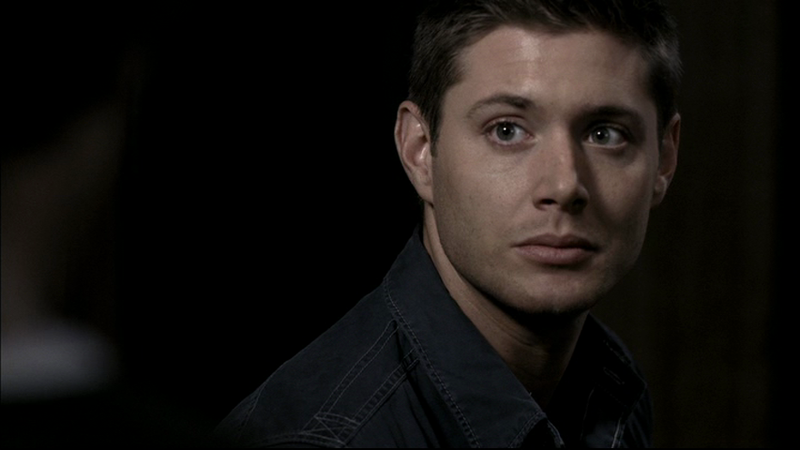 In All Hell Breaks Loose Part 2 (2x22), Dean is wearing it when he and Sam arrive at Bobby’s house. He keeps it on for the rest of the episode. This could be the shirt Dean wears in Bedtime Stories (3x05), when they go to check out the old woman’s house in the woods until almost the end of the episode. (Dean is only wearing a t-shirt while he sleeps at the end of the episode). In Fresh Blood (3x07), Dean wears this from when they go to track down the vampire that is tricking girls into drinking his blood until Gordon is killed. In A Very Supernatural Christmas (3x08), Dean wears it after they change out the suits after the second death, and Sam comes up with the meadowsweet – Pagan god connection. He then wears it to the wreath store and then back to the motel for the serious Christmas conversation. 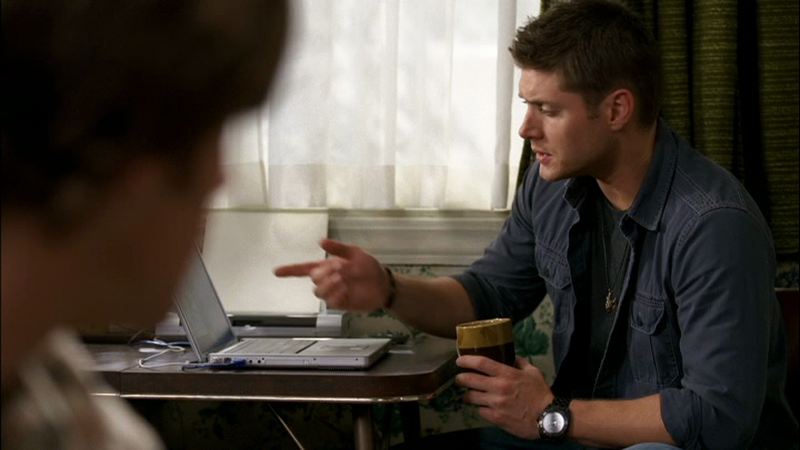 In Metamorphosis (4x04), Dean puts it on before he starts getting ready for the hunt with Travis (making the flamethrowers) and then leaves it on for the rest of the episode. In I Know What You Did Last Summer (4x09), this may be the shirt that Dean wears to go meet up with Ruby and Anna at the end of the episode. In Heaven and Hell (4x10), this may be the shirt that Dean wears for the entire episode, except the final scene. In Jump The Shark (4x19), Dean wears it from when they meet Adam at the diner, until he changes into a suit to go pretend to be FBI. I believe this is the shirt Dean wears in Good God Ya’ll (5x02), for the direction of his time in River Pass. In Changing Channels (5x08), Dean is wearing this shirt when he realizes that Sam is missing and discovers that he’s been turned into the Impala. He keeps it on for the rest of the episode. In Unforgiven (6x13), Dean wears it at the beginning of the episode, when he returns to the motel room and Sam gets the coordinates that lead them to Bristol, Rhode Island. In ...And Then There Were None (6x16), this may be the shirt that Dean is wearing in the graveyard at the end of the episode. In Hello, Cruel World (7x02), Dean is wearing this shirt when he wakes Sam up and demands to know what’s going on with his hallucinations. He briefly takes it off to wear a suit when he investigates the death of the swim team, but then puts it back on again until nearly the end of the episode. The paramedic removes it before loading him into the ambulance (or so it would seem). In The Girl Next Door (7x03), Dean wears this shirt when he escapes the hospital. In Defending Your Life (7x04), Dean wears this shirt when they go to check out the apple farm until Sam successfully saves his life. In The Mentalists (7x07), Dean wears this shirt when he and Sam go to the graveyard to burn the wrong sister’s bones. He keeps it on until they actually managed to kill the correct ghost. In Season 7, Time for a Wedding (7x08), this may be the shirt that Dean wears when he brings Sam the waffle-iron, and then later, when he returns to Becky’s apartment with Garth when he believes Becky to be in danger. In Plucky Pennywhistle’s Magical Menagerie (7x14), this may be the shirt that Dean wears when he and Sam return to Plucky’s to meet the janitor, only to find that he’s been killed in a bizarre ball washer accident. In The Girl with the Dungeons and Dragons Tattoo (7x20), Dean wears this shirt from the beginning of the episode until they take Charlie to the hospital. In Blood Brother (8x05), this MIGHT be the shirt that Dean wears for the entire episode. In Clip Show (8x22), Dean wears this shirt once they get back from visiting the priest in St. Louis. He keeps it on until the end of the episode.